And what if that waste is backing up around the world, reappearing in places where you really don't want it to be. Three months ago, China decided to ban 24 different grades of rubbish as part of its "National Sword" campaign against foreign garbage. Until now China has been importing millions of tonnes of the world's waste every year to feed its recycling industry. Robin Wiener, president of the US-based Institute of Scrap Recycling Industries, said: "More than 155,000 direct jobs are supported by the US industry's export activities, earning an average wage of almost $76,000 and contributing more than $3bn to federal, state, and local taxes. 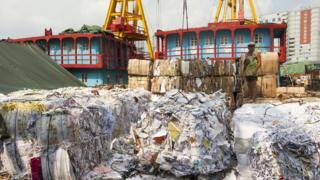 "A ban on imports of scrap commodities into China would be catastrophic to the recycling industry." For China the problem is simply one of pollution. Its submission to the WTO reads: "We found that large amounts of dirty wastes or even hazardous wastes are mixed in the solid waste that can be used as raw materials. This polluted China's environment seriously." Mike Baxter, external affairs director at the recycler RPC Group, says: "The easiest option for years has been put it into a container and send it overseas where the labour is cheaper and it can be sorted by hand." Even so, Robin Latchem, editor of the recycling industry magazine MRW believes the recyclers are not spelling out the problems loudly enough, and says: "Why no mention of growing domestic stockpiles of waste and the danger of more fires or incidents of waste crime? "I don't think it is scare-mongering to set out such fears, along with concern that public perception of the recycling industry in its widest sense will be heavily scarred by greater fly-tipping, larger-scale dumping and more plumes of heavy black smoke crossing housing estates." No minister from Defra was available for comment, but a spokesman told the BBC: "We are aware of this situation and are looking into the potential implications." But there is flip side to the problem - an opportunity for the recycling industry. That presents "a great opportunity", says David Wilson commercial manager of Vanden Recycling, a Hong Kong-based company with a new plastics recycling operation in Peterborough, in the UK. "China has voluntarily given up a six million tonne a year industry. We'll be selective about it and we'll go for materials we understand and markets we understand, but some of that lost capacity will be rebuilt here," he says. Andrew Bird, chairman of the UK's Local Authority Recycling Advisory Committee (LARAC) says as demand from China disappears, other markets are emerging, especially in India and wider Asia. Nevertheless, "there is going to be a little bit of pinch point, to say the least, and that will have an effect on price - that's the biggest risk for local authorities". Adrian Griffiths, the company's chief executive, admits there's no shortage of "feedstock" - the term for all the raw material that feeds the process. "We chemically recycle plastic. We take it back to the original material so it can become more plastic again: plastic, back to oil, and back to plastic again. Anything that goes to landfill currently is feedstock for us, and since the recycling figures are so low the vast majority of the plastic we want is not in recycling use anyway." Are big brand perfumes losing their allure? Are these the best job perks in the world? But tackling the global back-up of waste after China's changes will require investment. However, RCP's Mr Baxter says investors are not going to step in unless there is a market for recycled goods, and he believes governments have a role to play. "It's not just a case of recycling the material. It's having markets for the recyclates that are produced, and this is where government could come in." In the UK, he would like to see the government push local authorities and all government institutions to purchase recycled products. And he says one particular change could have a dramatic effect - the widespread adoption of Extended Producers' Responsibility. "It means producers having to pay to ensure the products they are manufacturing can be dealt with in an effective, and environmentally cost-effective way." Listen to Jamie Robertson's report on China's ban on waste imports here on BBC World Service's World Business Report programme.